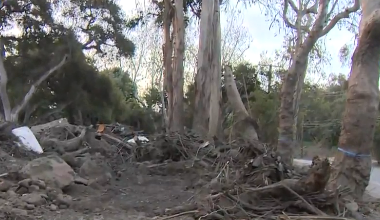 MONTECITO, Calif. -- Fire-scarred communities still digging out from under a mudslide are getting ready for another storm that promises to dump heavy rain overnight, forcing mandatory evacuations in Santa Barbara County, CBS Los Angeles reports. Flash flood watches were in effect Thursday in the foothills of Los Angeles and in Santa Barbara County, where a deadly mudslide devastated the wealthy seaside enclave of Montecito last month. Santa Barbara County issued mandatory evacuation orders Thursday for burn areas in the Goleta, Santa Barbara, Montecito, Summerland and Carpinteria areas. They apply to the Thomas, Sherpa and Whittier fire burn areas. The evacuation order takes effect at noon local time. Residents must be out by 6 p.m.
"The decision to evacuate these areas is being made out of an abundance of caution," Santa Barbara County Sheriff Bill Brown said in a statement. "Due to the size and breadth of the evacuation area, not all residents will be contacted in person. Do not wait for deputies or someone else to come to your home or business. Everyone should begin the evacuation process now." The National Weather Service said the heaviest rain is expected Thursday night through Friday morning, "when rainfall rates could reach a half-inch per hour, meeting the very low end of the USGS criteria for mud and debris flows over the Whittier, Thomas, Creek and La Tuna burn areas." By comparison, half an inch of rain fell in five minutes during the storm that led to last month's mudslide, which brought down boulders and trees and leveled homes in Montecito. Residents in the area are under an evacuation warning, which could be upgraded to a mandatory order. "Rainfall of this intensity can produce dangerous mud and debris flows near the Creek and La Tuna burn areas," the NWS said. Burbank city officials distributed sandbags to residents hoping to protect their properties from flooding or mud from the La Tuna fire burn area. Several cars and homes were damaged in a mudslide in that area last month. The Los Angeles Fire Department was offering ready-to-fill sandbags at all of its stations, and sand is available at select locations. More information is available on the Los Angeles Fire Department website. The department also has its swiftwater rescue teams ready to go as flood channels, washes, arroyos and storm channels fill up, spokesman Brian Humphrey said.